Turmeric is one of the most common ingredients in the Indian cuisine, imparting exceptional flavour and colour to most Indian dishes. Sure you know how delicious turmeric tastes, but there’s a lot more to the story of this bright yellow spice. In addition to being used for culinary purposes, turmeric has found applications for thousands of years in Ayurveda and traditional Chinese medicine in preventing and treating many health conditions. In Ayurvedic medicine, turmeric is believed to be a balancing agent, helping to achieve harmony among our ‘doshas’, that is our personal bio-energy centres: its heating quality helps to balance ‘Vata’ (air) and ‘Kapha’ (water) personalities and its bitter taste can help balancing ‘Pitta’ (fire). Modern scientific research has put this ancient wisdom to the test, confirming turmeric’s place as a nutrition powerhouse. There many incredible ways turmeric can help the body on many different levels and pathways: it exhibits powerful anti-oxidant and anti-inflammatory actions, while also helping with cleansing your liver, preventing heart disease and improving digestion. It really does seem that nature has provided us with a wonder herb! Its main active compound ‘curcumin’ is its secret weapon and is linked to turmeric’s many virtues. Today many nutritionists and naturopaths are recommending it as top dietary supplement proving that the new health rules are actually the old ones! Turmeric use has skyrocketed in the last decade primarily as a result of the current understanding of its key role in maintaining a healthy whole body inflammation response. But what is inflammation and why should you be concerned about it? Inflammation is usually a normal part of the healing process: if you injure or hurt yourself, the redness, swelling or pain you typically experience are just the results of your body going into healing mode and generating an inflammatory response. However chronic and persistent inflammation is a much different story and may generate a dangerous cycle that may lead to diseases. Modern life is full of inflammation triggers, including red meat, sugar, processed foods, caffeine and stress. 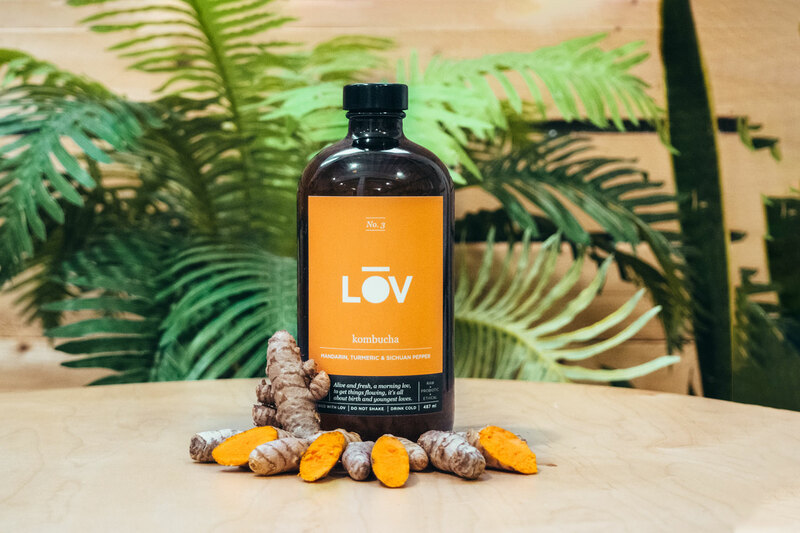 A diet rich in foods and spices with anti-inflammatory properties can keep you healthy and happy: that’s why turmeric and our Lov N.3 is definitely a fantastic combination to add to your daily routine! Inflamed muscles and joints for example cause most of the pain we carry around every day and curcumin can be just as effective as anti-inflammatory drugs, like aspirin or ibuprofen at suppressing such inflammatory response. Not to mention that it can support other more serious inflammatory conditions as rheumatoid arthritis, ulcerative colitis or IBD. Does your mood need a boost? Turmeric has also been shown to help reduce depression by increasing the levels of mood-regulating neurotransmitters like serotonin and dopamine, the well known happiness hormones. The potential role of turmeric in cancer prevention is perhaps the most fascinating. There have been studies which illustrate the promising nature of turmeric’s effect in inhibiting the growth of cancerous cells in some tumours. This is probably why the incidence of cancer is low in India as compared to the western countries. Turmeric is very versatile, lovely in sweet and savoury dishes, in stews and desserts and it can even added to drinks. That’s not a surprise that we decided to use it as flavour in one of our Lov recipe and our Lov N3 is definitely the best fit for your type if you enjoy peppery and funky tastes. previous post: LŌV No. 2 – What’s so super about blueberry?